Prophecy can go fulfill itself. Fin Tanner takes a certain pride in the spectacle of his gradual self-destruction, until he meets body piercer Rook Brandymoon. She punctures both his eyebrow and his cocoon of isolation. Fin and Rook bond over a joint, a game of chess, and conversation with Fin’s lava lamp, Vesuvius. After one carnal night together, Rook uses Fin to escape her toxic relationship. But the problem with a romance foretold by fate is that it comes with strings attached. Unbeknownst to Rook, the jewelry she installs in her customers -- including Fin -- contains black-ops nanotech that makes its wearer vulnerable not only to spying, but to mind control, and worse. The jewelry’s tech has drawn the attention of guerrilla televangelist Brian Shaw, who is bent on leveraging the transceivers to impose his dogma upon the masses. During a telepathic interrogation, the reverend unleashes Fin’s latent mental powers and triggers a meltdown that leaves Fin catatonic. Rook rebuilds him from the inside, cementing their bond. While Rook tackles the question of why Shaw’s heretical prophecies seem to feature Fin and herself, Fin struggles to halt the invasion of a proselytizing alien collective who utilize the tech-tainted jewelry in their attempts to spread their monstrous beliefs. Could it be that Fin truly is the Divided Man of Shaw’s prophecy, and Rook his Completer? The couple’s gritty, darkly humorous adventure leads them from meeting in a tattoo parlor to escaping a mercenary-infested factory; from hiding in an abandoned bomb-shelter to Rook’s imprisonment in a religious broadcasting empire’s luxurious penthouse; from the bizarre, dream-logic landscapes of the characters’ minds to the cavernous interior of the asteroid Gaspra. Ultimately, all Fin and Rook must do to save the world is stay together. Can they? Q: Describe the world where this story takes place. A: From the outside, Webster appears to be a typical northeastern college town, but under the surface things are dangerously askew. It’s consensus reality with an insidious twist. a reality that we sideswiped a couple of decades ago that’s still wobbling in its orbit. Q: Describe your style of science fiction. A: It’s intensely character driven, especially the characters’ flaws. It has complex plots. But the most important thing that all of it has in common is that there’s a dangerous secret, a Big Idea, embedded in what appears to be the normal world. 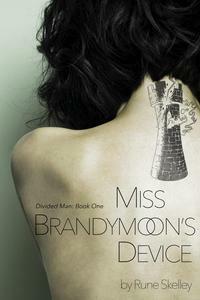 Q: Miss Brandymoon’s Device?is a novel that isn’t entirely comfortable being categorized as science fiction. But if you agree not to call it that, it insists that it has all the extraterrestrials, nanotechnology, and telepathic powers anyone could want. A: That’s not a question. But, yeah. It’s fun to read novels that cross genres and defy categorization. And when you can’t find enough of them, sometimes you have to write your own. Q: Is that why you write? A: Writing’s a thrill! Putting pictures in someone else’s head, stirring the feelings of another person, that’s magic. Writing offers a chance to get to know interesting people; you just have to make them up first. In fact, it lets you be those other people, and go with them to impossible places. And then it lets readers have that experience, too. Q: Is this novel part of a series? A: Miss Brandymoon’s Device is the first novel in the Divided Man Series, which currently feels complete at three novels. But never say never: it could someday inspire further writing. Q: When will the sequel be available? A: March 2017. Sooner if the stars align.